These terms of service are designed to help our clients understand the service they are purchasing. These terms clarify and describe our guarantee, exclusions, cancellations and potential problems we strive to avoid if at all possible. With your help, these issues can be averted to ensure a successful service to you in your home. These Terms of Service define the responsibilities and liabilities of My Amazing Maid and our customers. Remember, we do NOT have a contract that commits you to a minimum number of cleanings! We work to earn your continuing business with each and every cleaning. If you are not happy with any area we have cleaned, simply call the office within 24 hours and we will come back and re‐clean it free of charge. The cleaners must be allowed to come back into the home within the next 2 business days. Getting customer feedback is an important ingredient to a successful maid service relationship. It is important to use the online Quality Scorecard to provide feedback on your cleaning experience. The scorecard is fast and simple. This feedback helps us know your personal preferences and monitor the performance of your maids and deliver the highest quality cleaning experience in the industry. Feedback after each cleaning allows us to address any concerns before they become a larger issue. We carry a $1,000,000 liability insurance policy and a $5,000 fidelity bond. All cleaners are covered by State workers compensation insurance for any injuries occurring inside or outside of your home. My Amazing Maid is not responsible for any charges from a local police department which is called out due to an activated alarm which we are not able to turn off. We cannot be responsible for pets that “escape” when our cleaners are entering/exiting your home. If your pet will be “roaming free” during the clean, please let us know in advance, so the cleaners can be on alert when they open doors. Our cleaners are trained to close doors as soon as they enter and exit your home and will not leave doors open for long periods. Your price for cleaning is based on the cleaners focusing all of their time and energy on cleaning, not routine housekeeping. We ask that you take a few minutes the night before a scheduled service to “pick up.” This will allow the cleaners easy access to the areas/surfaces to be cleaned: floors, countertops, table tops, etc. and removing dirty dishes from kitchen sinks. If you’d like our cleaners to do these tasks for you, please call the Office (in advance) so your cleaning fee can be adjusted for the additional “cleaning preparation” time. • Excessive dirt/dust/stains from remodeling/construction, post‐party cleanup, etc. • The condition of your home is different than what was represented when we established your price at the estimate consultation. If a particular cleaning requires significantly more time than allotted to finish due to the situations above, we will attempt to contact the customer by phone before we start the job. If we are unable to reach the customer by phone we will either work up to the allocation of time or not clean the home. We will never charge you more for your cleaning without your permission. If additional time is repeatedly needed, we would need to discuss a change in your regular fee. During the estimate consultation, you are provided a specific, comprehensive list of the cleaning tasks the cleaners will conduct at your home. The cleaning price is based on this list, plus any extra requests discussed at the time of the estimate. During the estimate consultation, we typically allow up to 3 deviations from the list of tasks, if they are not overly time consuming. Please do not leave notes or give “extra” instructions to cleaners. If you need extra service, please contact the office to discuss your needs and pricing. Our cleaners bring the tools and products needed to thoroughly clean your home. If you prefer to supply your own cleaning products or solvents we are not responsible for any damage associated with that product or solvent. Our cleaners take pride in dusting your home. Our tools and techniques allow us to remove most of your home’s dust in a reasonable amount of time and effort. • Settling Dust: During the dusting process, some dust becomes airborne and will not settle until we have left. This is more common in first time cleanings, and it may take several visits before settling dust becomes minimized. • Dusting Knick‐Knacks, Collectables, Stand‐up Picture Frames, and other small items: We dust small items based on the size and the number of items on a shelf or flat surface like a mantel. If there are 10 or fewer small items on a shelf we will hand dust them and the surface below and return the item to the shelf. If there are more than 10 items per shelf we may dust the items where they sit and the surface around them. • Dusting height limits: We are not able to dust items on shelves or hung on a wall that are higher than a cleaner can reach standing on a 2 step stepladder. We do use extension poles to high dust rooms but we will not high dust items that may tip over or hung on the wall because we are not able to hold it with one hand in order to secure it while we dust. Showers and Tubs can accumulate lime, calcium and soap scum. Our cleaning solutions work very well on cutting through these deposits, however sometimes it may take two to three visits before showers and tubs become free of these deposits. Mold and mildew are organic and will grow deep into and behind grout or calk. Surface stains will be minimized by our cleaning products, but completely eliminating it may require the homeowner to have their shower re‐grouted or re‐caulked. Our cleaners cannot touch or pick up pet feces, including emptying litter‐boxes. The cleaning supervisor on site may approve the mopping of pet urine at their discretion. Dried urine stains on hardwood floors will be mopped by our cleaners, but please understand that if urine has soaked into wood, the discoloration (stain) may not come out and a flooring specialist should be contacted. We cannot vacuum wet kitty litter. • Carpet & Rug Snags: Carpet snags are the result of “exposed loops” caused by normal wear and tear, moving furniture, etc. which are snagged by a vacuum’s roller‐brush. We use top-of-the-line Miele vacuums. These vacuums are set to industry standards in order to limit snags while still providing a high quality vacuuming. • Broken Blinds: Customers should be aware that there are some inherent risks each time your blinds are cleaned. Blinds will become brittle from daily exposure to the sun, and strings/chords will weaken over time resulting in breaks. • Improperly hung pictures/decorations/mirrors/fixtures: If these items are securely/properly attached to the wall, they should not fall when the item is dusted/wiped. • Artwork, Collectibles, Family Heirlooms and valuables over $75: These items are expensive or impossible to replace and so we will not take the risk of cleaning such items. It is the customer’s responsibility to inform My Amazing Maid of any such items existing or brought into the home after our initial setup, that fall into this category. • Use of Homeowner’s Vacuum: If you request our cleaners to use your vacuum, we will not assume or accept any liability for damage to the unit. (Since we are not responsible for maintenance or training with the unit, we will not be responsible for any repairs to it). Payment is due at the time our services are delivered. You may pay by check, e-check or credit card. Credit Cards and E-Checks. Clients choosing this option must provide a credit card or bank information to the company for regular charges. Charges will not be applied until after the cleaning is completed. Refunds. Since cleaning is a very personalized and subjective service, we cannot offer refunds to customers. If you are not happy, we will come back and re‐clean any areas free of charge according to our 100% Satisfaction Guarantee described above. Service fee for returned checks. Checks returned for non‐payment, (insufficient funds, closed account, etc.) will be charged a $25 returned check fee in addition to making good on the payment for services. When booking your service, we provide an estimated arrival‐time when your cleaning team will arrive at your home. Actual arrival time may be one hour before to one hour after this appointment time due to unforeseen circumstances (traffic jams, weather, the cleaning team needing extra time to finish cleaning a previous home, etc.) If your cleaning team is expected to be late by 30 minutes or more, they will call you. If we must wait to gain access to the home or wait until we can begin cleaning, you will be charged the regular rate for that time. Most customers provide us with a spare key. This ensures our team’s access on cleaning day and helps prevent “lock-outs”. Keys are numbered and kept in our key‐safe. Keys are never labeled with any identifying information such as client name or address. Management checks out/in keys each day. Gate, garage and alarm codes are handled in the same discrete manner as keys and are not recorded in the client’s profile. My Amazing Maid is not responsible for any charges from local police departments called out due to an activated alarm that we are not able to turn off. Some customers choose to leave a door unlocked or to hide a key for the maids on cleaning day. We do not recommend this practice but if preferred we will make notes in the customer profile as to the instructions for entry into the house. If you forget to leave the door unlocked or leave the key out and our maids cannot enter your home, a “lock‐out fee” in the amount of 1/2 of the estimated cleaning price may be assessed to cover the cost of our employee’s time. We will send a text message 48 hours in advance of your cleaning, followed by an e-mail at least 24 hours before the cleaning. The text and e-mail will give an approximate arrival time. Actual arrival time may vary due to unforeseen circumstances (traffic jams, weather, the maids needing extra time to finish cleaning a previous home, etc.) If you need to us to arrive at a particular time for a cleaning, please notify the office at least 48 hours in advance so it can be scheduled accordingly. In order to hire the very best staff, we have to assure our employees that they will have a certain amount of work. Your cleaners count on your business. If you must cancel or reschedule a cleaning, please give us at least 2 business days’ notice. This gives us an opportunity to find another home for them to clean. Last minute notifications make it nearly impossible to find your cleaners work and can cause them financial hardships. This can lead to higher employee turnover rates which leads to greater challenges in delivering high quality cleaning. If you must reschedule or cancel service with less than a 48 hours notice, we charge a fee equal to 1/2 the estimated cleaning fee. which is used to cover lost wages that the maids will incur due to the cancellation. We rarely have cancellations from clients who provide us with a key, which can potentially save you money and results in higher client satisfaction. • Example 1: Bi‐Weekly customer “skips” a cleaning, creates a four‐week interval between visits and the applicable (higher) Monthly rate will apply to the next cleaning. • Example 2: Bi-Weekly customer “skips” a cleaning, creating a three-week interval between visits and an hourly rate will apply to the next cleaning. • Example 3: Bi‐Weekly customer who requests an additional cleaning in‐between scheduled visits would be charged the applicable (lower) “Weekly” rate for the next 2 cleanings as there will be a one‐week interval between both cleanings. • Example 4: Monthly customer requests more than 4 weeks between cleanings. The next visit will be billed hourly, and then the recurring service price will resume with a new 4 week interval. We are happy to work with customers to reschedule and cancel services throughout the year to work around your schedule. This policy has to do with rescheduling service or canceling an appointment with less than 48 hours’ notice. In the event that you need to reschedule or cancel your appointment with less than 48 hours notice, you may be assessed a fee equal to 1/2 the estimated cleaning fee. Lockouts occur when we arrive at your home but are unable to enter due to doors being locked, key not available or other issue. Lockouts may be assessed a fee equal to 1/2 the estimated cleaning fee. Please note, that some last minute cancellations can be prevented if a customer provides us with access to their home using a garage door code, key, lockbox or other methods. 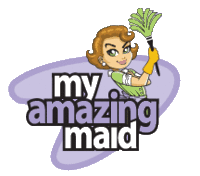 My Amazing Maid is bonded and insured against any problems associated with giving us access to your home. We offer gift certificates which never expire. However, we do not offer refunds on gift certificates. My Amazing Maid randomly inspects and audits our cleaning teams. The inspector may inspect your home after a cleaning is completed and when the cleaning team has left, or during the final phase of cleaning or during the entire cleaning. Our Quality Inspection may include taking before and after photos of our cleaning technicians’ work. These pictures are used for training, proof of our work performance and promotion of our high quality standards. If you do not want pictures taken of work areas in your home please notify My Amazing Maid. During summer months, many of our customers set their thermostats to higher temperatures during the day, while they are at work. On the day that your cleaners arrive, we ask that you set the thermostat to, at the highest, 72, so your cleaners can work in a safe environment without overheating. For safety reasons, if our cleaning team arrives to a home that is warm and the air conditioning is turned off or not reduced to safe levels, the team supervisor is instructed to adjust the thermostat while they are in your home. They will return the temperature to the previous setting before they leave. We still ask that you to let the air conditioning run on the day of your service because it can take several hours to cool a home to safe levels. When entering into an agreement for services with My Amazing Maid please do not solicit for hire any staff member introduced to you by My Amazing Maid for any home‐related services. Our cleaners sign a non-compete agreement and are prohibited from working for our clients outside our business. Please do not put them in an awkward position by asking them to work for you independently. However, if you do wish to employ a staff member directly please discuss this matter with the owner of My Amazing Maid. If you are found to have solicited one of our staff please be advised that our referral/ training fee is $2,500 per hired employee. Payment is due within 30 days from the date on the invoice. We consider our employees our most valuable asset and charge accordingly. My Amazing Maid is committed to protecting the privacy of customers. We will not sell, exchange or otherwise distribute your personally identifiable information to outside parties.